Slim Birdy - Lite as a Feather. From flab to fabulous, author Kristy Zenk reveals her secret to long lasting weight loss. 81 page ebook. NOTE: THIS BOOK IS NOT BASED ON THE DR RAY PEAT PROTOCOL - this book is based on low carb before I found Ray. 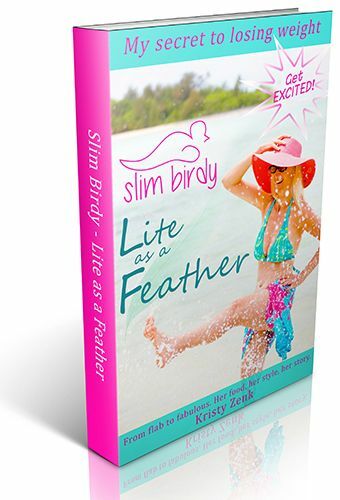 Ebook, Lite as a Feather by former fatty - Kristy Zenk - is a refreshingly different approach to weight loss; it’s not a get thin quick scheme. Note from author: This book is based on low carb and low sugar and is not my current eating style 5 years on. See further note below for more explanation. Visually stunning it's just a delight to read, this could potentially be the last weight loss advice you will ever need. “This is the first book on weight loss where I related to 95% of it. It was like she was writing about my relationship with food. I loved it!” - Sarah C.
“Very funny, I loved the part about all the types of exercise she tried and hated. Related to the crazy journey she went through to find peace with her body and food – totally true for me too.” - Katie G.
“The story around coffee was exactly how I experienced it too. Uncanny!” - Adrian A. “I love the way she writes - funny, funny, funny! I so fully related to what she was saying and it felt like we were total twins in some areas it was scary. A great way to tackle what is a difficult topic for many.” - Jodie S.
Follow on Facebook and Instagram to see what is working for me now. New ebook on high metabolism workouts out now - One Ten Toned - which is based on RAY PEAT. Full-size high-resolution pages, ready for viewing on your tablet, computer monitor, or phone.